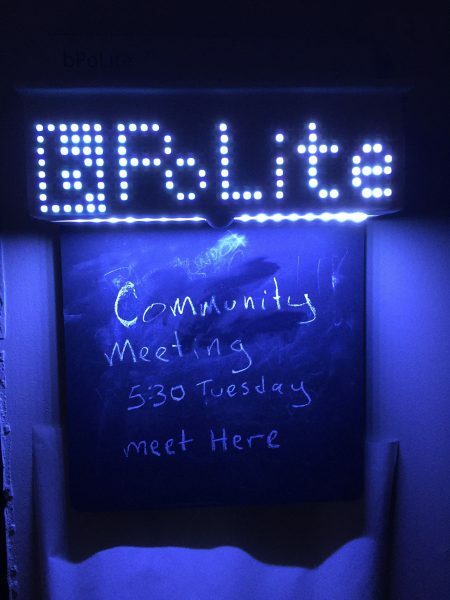 bPolite is a prototype community curated message board intended to create a place where community discussions could happen in the physical world, thus increasing the sense of community within a neighborhood. 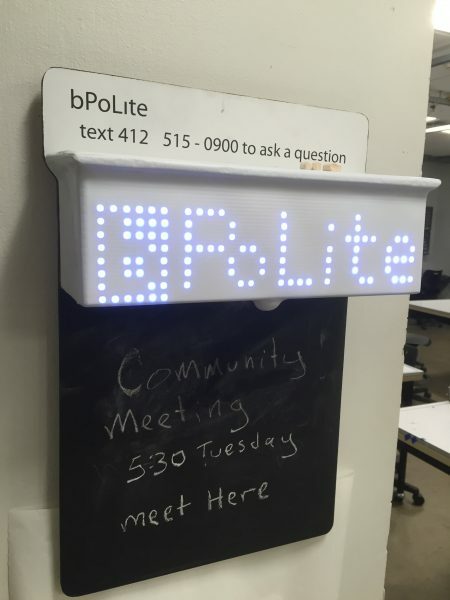 bPolite consists of a chalkboard attached to a scrolling display showing a question. Members of the community can use chalkboard space to answer the question and build a response together. Questions could be anything from how to deal with a neighborhood issue to what peoples favorite ice cream flavor is. If a member of the community has an idea for a question, they can text the display from any phone (they don’t have to have a smart phone) and their question will be posted to the display after being checked by a moderator who also lives in that community. We used a variety of tools and techniques to create our prototype including: Arduino, Raspberry Pi, twillio (for SMS), vacuum forming, and basic fabrication techniques. Full technical writeup can be found here. 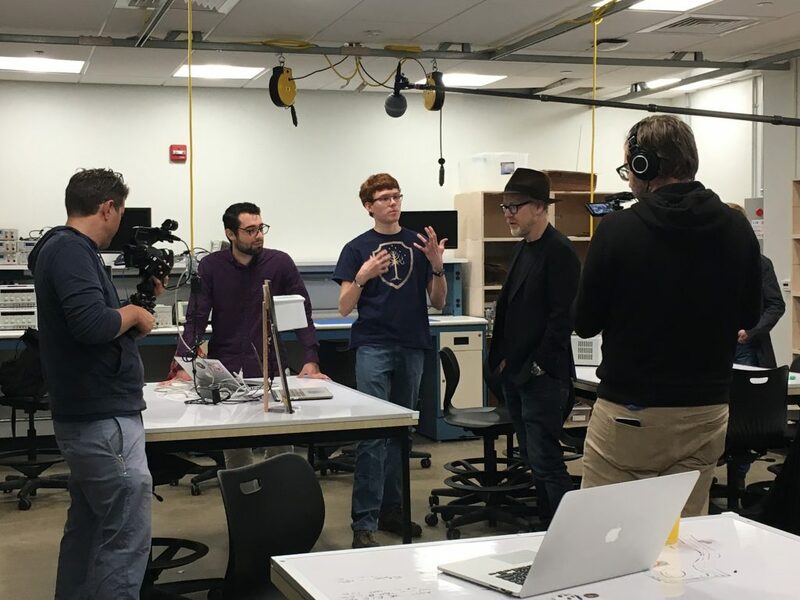 On October 6th, 2016, we had the opportunity to show this project to Adam Savage when he visited the IDeATe program at Carnegie Mellon. The original documentation post for this project can be found here. My contribution to this project was designing, building, and programming the tech side of the message board. The board could be texted in order to set the display, and a website with pictures of the display was hosted from the device. 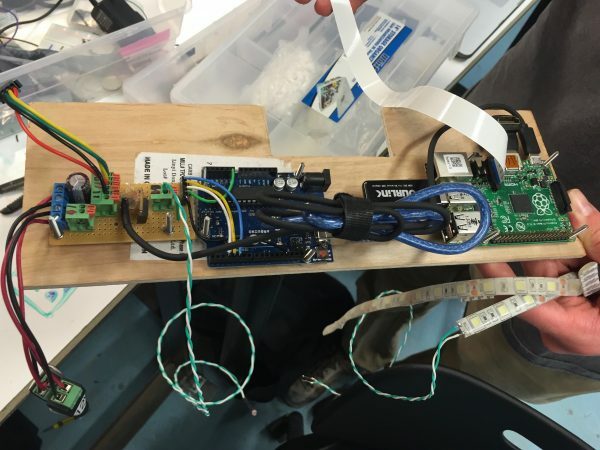 This was a group project for 48-390, Physical Computing Studio at Carnegie Mellon University. Collaborators were: Daniel Campos and Erin O’Neill.